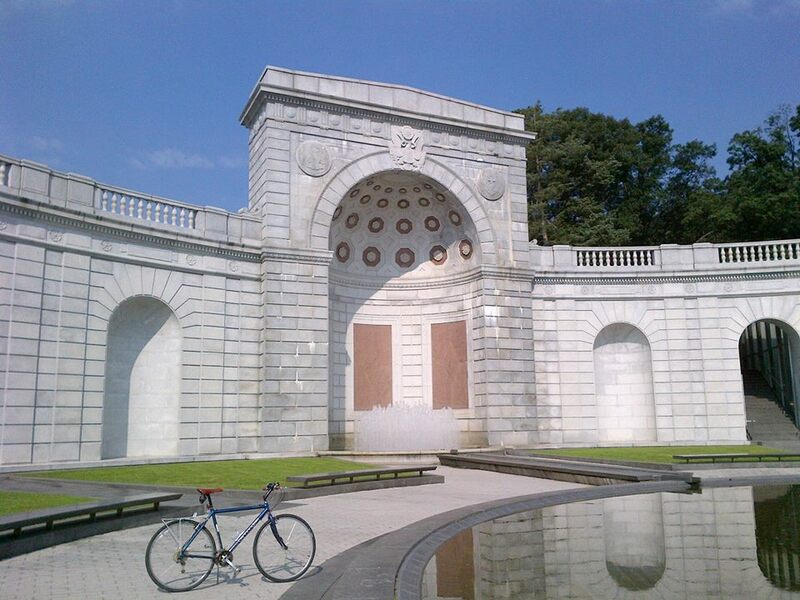 On this bike ride I went to see the Women in Military Service for America Memorial (WIMSA). Many people who have seen this relatively new memorial are not even aware that they have. 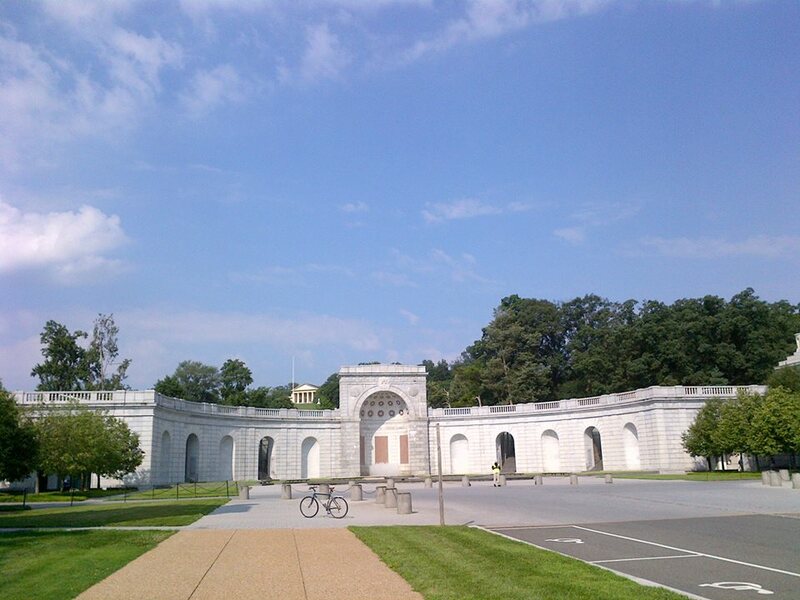 Almost any visit to Arlington National Cemetery includes seeing the WIMSA, because the memorial is located at the western end of Memorial Drive (MAP) as a ceremonial entrance to Arlington National. In the early 1980s, women veterans began pressing for a memorial to women in the U.S. armed services. They initially won the formal support of the American Veterans Committee (AVC), which was founded in 1943 as a liberal veterans organization and an alternative to groups such as the American Legion and the Veterans of Foreign Wars, which supported a conservative political and social agenda. The AVC established the Women in Military Service for America Memorial Foundation (WMSAMF) to raise funds and lobby Congress for a memorial. The foundation turned first to the larger veterans groups, and won the support of both the American Legion and the Veterans of Foreign Wars. With most veterens solidly behind the effort, the decision to build the memorial was essentially a foregone conclusion, and legislation for the Memorial was introduced and passed the House of Representatives in November 1985. After her retirement from the U.S. Air Force in 1985, Brigadier General Wilma L. Vaught became the primary spokesperson for the WMSAMF. According to Vaught, she was elected president of the memorial foundation because she missed the first meeting and was not there to turn down the honor. Under her leadership, the site selection process identified its current location. And even though the existing Hemicycle and entrance to the cemetery was listed on the National Register of Historic Places, permission was granted to modify the site to create the WIMSA. The design was then selected through a national competition. Finally, construction of the Memorial began, and was in progress for approximately 11 years. The WIMSA was officially dedicated October 18, 1997. The Memorial dedication ceremony began with a fly-over of military aircraft, all of which were piloted by women. This was the first time in U.S. history that an all-female fly-over had occurred. Speakers at the event included Secretary of Defense William Cohen, Vice President Al Gore and Tipper Gore, Associate Justice of the Supreme Court of the United States Sandra Day O’Connor, retired General John Shalikashvili, and the Chairman of the Joint Chiefs of Staff, General Hugh Shelton. President Bill Clinton and First Lady Hillary Clinton addressed the audience via taped message, as they were on a state visit to South Africa. But the highlight of the dedication ceremony was 101-year-old Frieda Mae Greene Hardin, a veteran of World War I. She was escorted to the speaker’s podium by her 73-year-old son, and wore her World War I Navy yeoman’s uniform. An estimated 30,000 people attended the ceremony. The Memorial was permanently opened to the general public two days later. 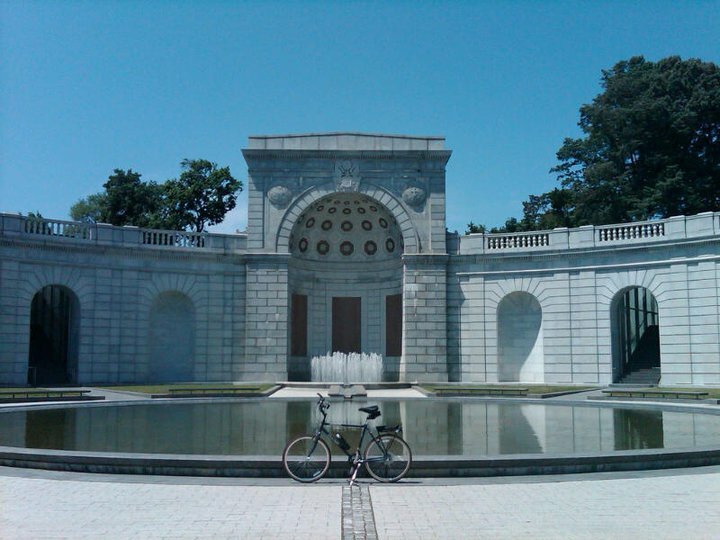 The WIMSA site is the 4.2-acre ceremonial etrance to Arlington National Cemetery. A 30-foot high curved neoclassical retaining wall stands at the entrance, with an education center in the cemetery hillside behind the existing retaining wall. The Memorial incorporates a reflecting pool on the plaza in front of the curved gateway, or hemicycle. And the Memorial’s roof is an arc of glass tablets inscribed with quotations by and about women who have served in defense of their country. Sunlight passing over these quotes creates changing shadows of the texts on the walls of the gallery below and brings natural light into the interior of the Education Center. Four staircases pass through the hemicycle wall, allowing visitors access to the education center, as well as a panoramic view of D.C. from the terrace. John F. Kennedy’s Homes in D.C.
Because he was so young when he was assassinated in 1963, it is difficult to picture John F. Kennedy as anything but a relatively young man. But had he lived, John F. Kennedy would have turned 97 years old today. To mark the occasion, I decided to go on a JFK-themed bike ride. I could have ridden back out to Arlington National Cemetery to see The Eternal Flame at his gravesite. Or I could have ridden to Dallas where he was assassinated, although that would have taken more time than I had. But instead of allowing the emphasis to be on his death, I wanted the ride to focus on his life. 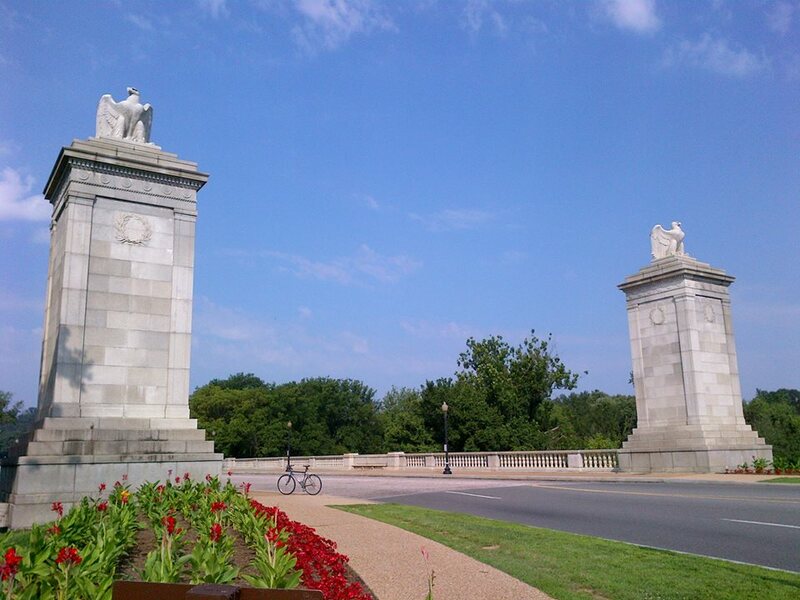 So I decided to ride to where he lived, or at least where he lived while he was in D.C. Prior to being elected President, Kennedy served for six years in the House of Representatives, and then eight years in the U.S. Senate. During those different times living in the nation’s capital, he lived in six different houses. On today’s ride I tracked them all down to see the places where he lived. It was a great day for a ride, and worth the trip to see these historical houses. Kennedy had a preference for living in Georgetown, so all of his residences were in that neighborhood except his last one, which was downtown at 1600 Pennsylvania Avenue. His first D.C. home, as seen in the photo above, was at 3307 N Street (MAP). His subsequent homes, depicted in order in the photographs below, were located at 1528 31st Street (MAP), 2808 P. Street (MAP), 3321 Dent Place (MAP), and at 1400 34th Street (MAP). And, of course, his last and most famous residence in D.C., and where he was living at the time he died, was located at 1600 Pennsylvania Avenue (MAP), and is named The White House.